Spark by Arturia is a Virtual Instrument Audio Plugin. It functions as a VST Plugin, an Audio Units Plugin, an RTAS Plugin and an AAX Plugin. 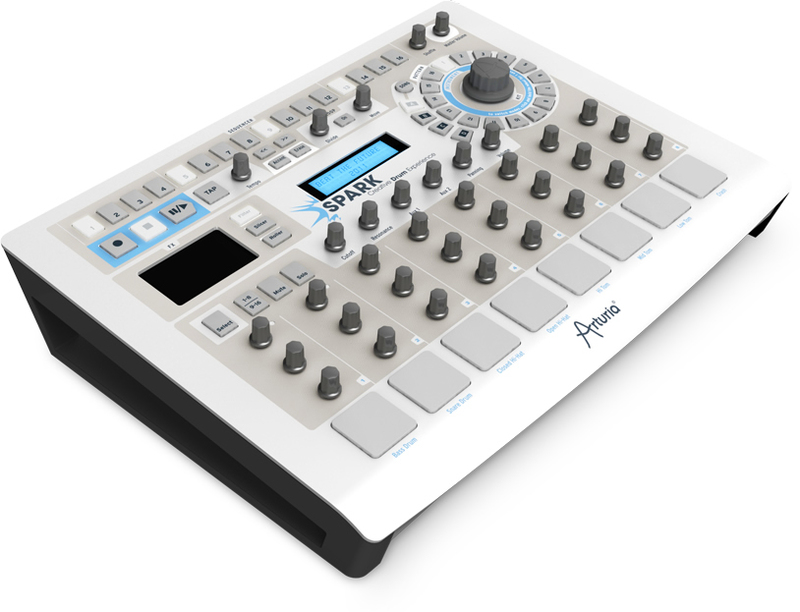 Spark is a creative drum machine combining the intuitive hands on control of hardware with the power and integration of software. By using analog synthesis and physical modelling as well as samples, Spark's sound engine opens a new realm of possibilities in drum design. Subtle fine tuning or dramatic transformations are available instantly at your fingertips, making Spark a flexible and intuitive instrument. Spark not only integrates seamlessly into any studio configuration, it is also perfect for live performance, thanks to uniquely designed controls such as the FX Pad with filtering and slicing modes, or the advanced Looper. Spark is loaded with thirty different kits offering emulation of famous drum machines, virtual acoustic drum sets and innovative sounding beatboxes. Vintage drum machines: Analog emulations of the TR-808, TR-909, Simmons SDS-V, and Eprom based LinnDrum, Drumtraks, DMX, TR-606, Linn 9000, KPR-77, Drumulator, and more*. Electronic kits covering the most popular modern music styles: Dub, House, Techno, Hip Hop, RnB... as well as experimental fields thanks to the physical modelling engine. Acoustic drum kits subtly mixing physical modelling and samples for high audio realism. Pristine quality sound engines including: TAE Analog synthesis, Multi layered sampling delivered by reference third-party companies, Physical modelling. FX Pad with Repeat, Tape, Reverse, Strobe, Pan, Mix, 3 mode Filter and Roller. 16 track mixer with 14 high quality effects: compressor, reverb, bit crusher, multiband EQ, chorus, delay, distortion, phaser, plate reverb, Destroyer, Flanger, Limiter, Space Pan and Sub Generator. Song Mode with up to 64 patterns by song. 30 knobs for in-depth and immediate sound control. Disclaimer: I own the software, but not the dedicated controller. I heard the hardware is really cool. There's something to be said about beating on something, but I am not able or qualified to comment on that at this time. 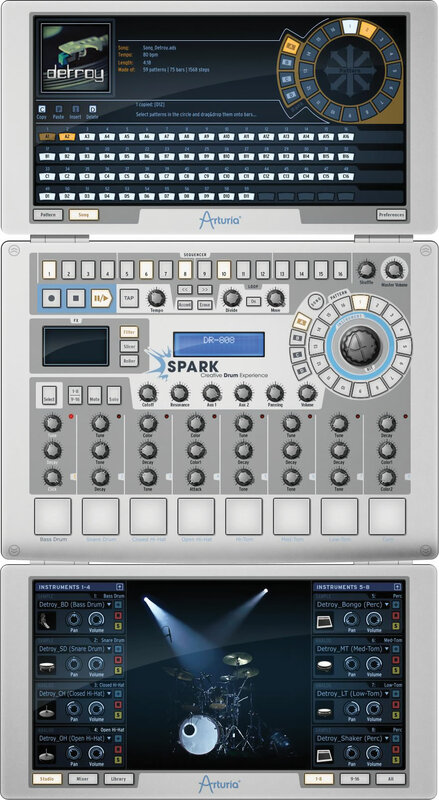 Spark by Arturia is an epic virtual drum production workstation featuring smooth sequencing capabilities, powerful synthesis engines, and a really big sound library that contains a multiple genre variety of kits including solid emulations of all the great vintage drum machines and modules. This software is truly a power house. It can do so much, and does it so well. I'm not usually a fan of hybrid workstations and DAWs and other packages that do "everything." In general, I prefer separate components, but in this case, I'm happy to make an exception and embrace the convenience of having it all under one eight-page hood (Main, Sequencer, Song, Studio, Modular, Mixer, Library and Prefs). Spark delivers power, control, performance, and flexibility. Creating custom kits is no problem and user samples can be loaded in the Studio Page. Users can choose between samples, synthesis (physical modeling, TAE Analog emulation), or file import. Tools are available to create new sounds via the Modular Page. There are many performance features, including an X/Y pad for in vivo editing and triggering various assigned parameters. It's a snap to sequence patterns and construct them into a song is a snap via the Song Page. There are two sequencer modes — step sequencer (with Roland-esq running lights) or live recording. Tracks are selected with a dial. There are 16 tracks with 64 steps. Like any well-thought out, well-designed audio software, Spark has many little features that are revealed along the way as you dive in, e.g., If you dig the first half of a pattern you create and want to repeat it for the second half, you simply increase the number in the sequencer toolbar and voila! MIDI drag and drop along with perfect clock sync create a perfect union between Spark and DAW. • Sharp-looking, futuristic, well-organized interface. 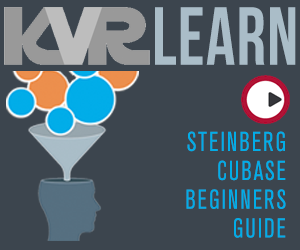 • Deep sound and programming with a moderately shallow learning curve (for anyone who has a little drum machine experience). • Convenient and intuitive preset management (loaded via library window). • Considerable tweakability, especially for sound designers who venture into the Modular page. 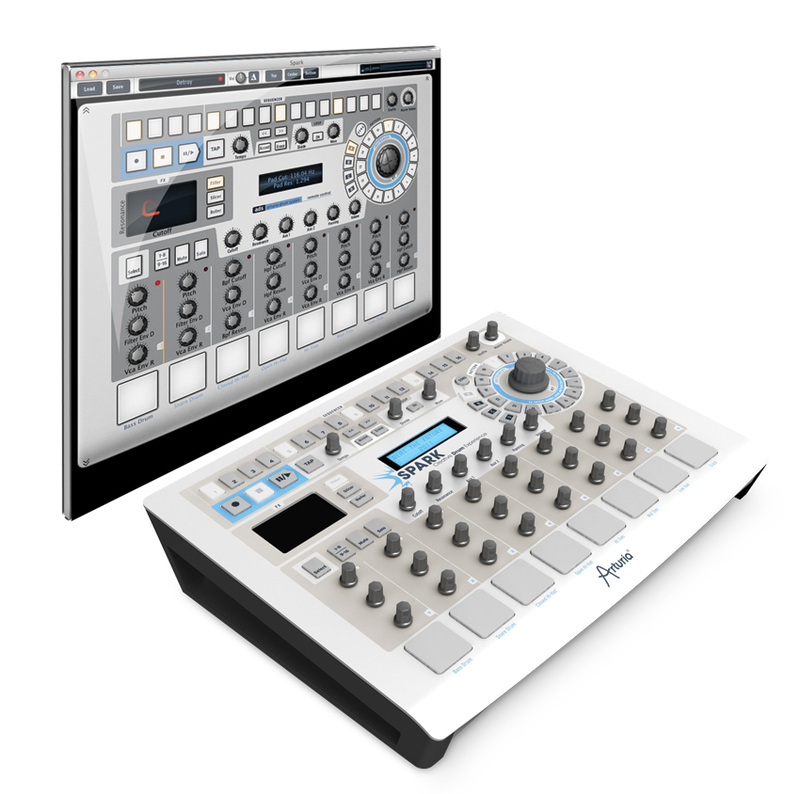 • Responsive virtual pads, sliders, knobs, dials, and X/Y pad. • Live FX pad and effects buttons to change the sounds in real time. • Ability to mix and match instruments to build own kits via Studio Page. • Powerful integration of sample, physical modeling, synthesis, and imported audio files. • Reliable and stable. It has never crashed or froze on me. • Useful manual is written clearly and thick, but probably not needed. • Firmware updates add new kits. • Helpful forum community support. • Authentic, enthusiastic developer team with a proven track record of providing top quality software (and hardware). • Preset patterns could be better. • 16 sounds per kit may not be enough for some projects. 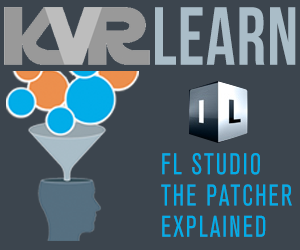 • Limited editing of imported audio files. • Requires a strong CPU to maintain zero lag. • I've never been a fan of blips, beeps, bass, and synth sounds in a drum machine, but some users may find a use for them. Spark is a monumental beat-making monster. It has a timeless analog flavor with all the convenience, flexibility, and possibilities that digital has to offer. For musicians and alike who want to work quickly — it can be fast and easily satisfying. For sound designers who want to get under that hood and tinker — it can be exciting and rewarding. To quote another,"If you are looking for an awesome drum machine plug-in, and not a more generic sampling tool, then the Spark is for you!" If you dig a variety of electronic drums, Spark undoubtedly offers something for you; yet, if you're exclusively looking for a "real" live, acoustic drum vibe, I would suggest looking at the other options out there. The same is true if you are exclusively into synthesis or sampling. However, if you want a monster hybrid that can shake your walls — look no further! It looks and behaves enough like the old vintage gear to make you nostalgic, and has all the ultra modern enhancements to keep you excited. I highly recommend this beast to any eMusician, producer, film and game scorer, DJ, sound designer, etc., who is looking for an amazing array of drum machine features and sounds. I tip my hat (if I had a hat) to Arturia for developing such a fine piece of audio software. I recommend buying as part of the V-Collection and never looking back. So what is the opinion on the Spark? Anyone using this machine hybrid? Looks like bugs are being addressed by Arturia with recent updates. Seems easy to use. Any issues to getting Spark now? Basically it runs on samples - but they're actually really high quality. The main downside is It's a huge CPU killer, and it froze Reaper both times I tried it. Kind of an awkward 3 panel interface, too. Probably only worth it, if you own the machine that goes with it. Kind of a lot of money for that kind of trouble imo. "Basically it runs on samples"
... AND a huge modular synth engine (full editing unlocked in v2). I like the intro videos! If it is stable under Cubase I would give it a try. Okay, quick tip. If there are CONS in your list, the rating is NOT 10 out of 10. You are correct! A few cons would normally mean it's less than perfect, but here is my rationale for the 10 rating. .. Giving this plugin a 9 rating would be too low. If there was a 9.5 option, I would have chose it! When I was in school the highest score you could get was a 4.0. Now, my nephew graduated with a 4.3. What the? I guess what I saying is this. .. . Spark offers many bonus/extra credit features that go beyond 10, minus some points for the cons. .. .